Travel by rail, either by products or by people themselves, changed the way life in Victorian England was lived. The railways opened up an entirely new world for commerce, fun, and relaxation. Fresh produce could be shipped across the country and upon arrival at its destination, it would still be fresh. Newspapers, magazines, and other periodicals could be printed in London and then whisked to Edinburgh on the same day. Upon its arrival, the information provided would still be current. Time-saving inventions, such as the vacuum cleaner, allowed for more leisure time. Families could enjoy a day at the seashore as the railways offered a fast, efficient, and inexpensive way to enjoy time off. In the first half of the 1800's, over six thousand miles of Victorian Railway was available for use. By the end of the 1800's, there was hardly a small town in Great Britain that didn't have access to a railway station. With Isambard Kingdom Brunel as its chief engineer, this railway company made tremendous strides from 1833 onwards. A railway line from London to Bristol was the target, and this was completed by 1841. Seven years later, railway lines from Bristol to Exeter, and from Bristol to Gloucester were constructed. The locomotive for this portion of the Great Western was designed by Daniel Gooch and could run at the great speed of 67 mph. Due to the gauge which Brunel was using for the lines, Gooch's train could not enter Euston Station. Thus, Brunel built his own station - Paddington. For the thirty years between 1841 and 1871, Brighton was the fastest growing town in England. This was due to the railway connecting the town with London. The first train pulled into the Brighton station in September, 1841. Originally filled with only first-class passengers, this Victorian railway quickly realized that lowering the ticket price would enable more people to journey to Brighton. With the numbers of visitors swelling the seashore area, entrepreneurs soon made Brighton their home. Hotels, restaurants, and other tourist attractions soon filled the town to overflowing. Brighton, as a seaside holiday spot, was born. 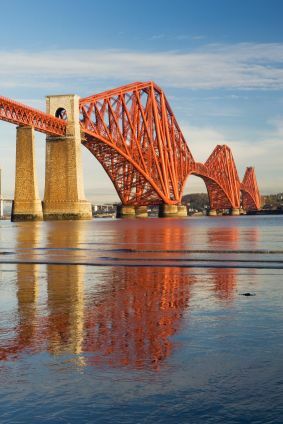 In 1848, the first through service from Scotland to London was established. Six years before, Glasgow and Edinburgh had been connected. Now the line headed south. The Caledonian Railway Box can be seen at the Bo'ness and Kinneil Railway Museum. With the completion of London's Kings Cross station, Cambridge, Leicester, and Nottingham were connected to London. With a reputation for giving good service, and offering express trains, this Victorian railway into more Northern parts of England became quite popular. It was quite lucrative for the owners, also. Coal was transported from Yorkshire to London and the revenues were great for this rail company. The Stockton and Darlington Railway was the first, in 1825, to offer an open-to-the-public service. Passengers and goods were placed upon the same train. 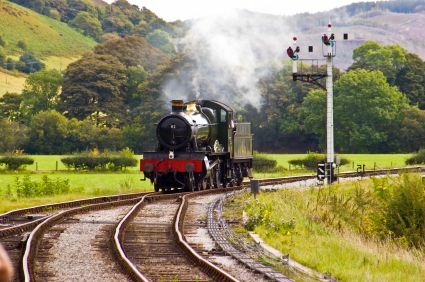 It was also the first railway line to use a steam locomotive. In the early years, train travel was not a comfortable way to get from Point A to Point B. Seats were often just wooden boards, and springs and buffers were an unknown commodity. The best way to describe the ride is to compare it to riding in a stagecoach. Eventually, Victorian trains began to offer comfort. Upholstered seats, armrests, and an enclosed carriage were soon the norm, at least for first class passengers. Oil lamps placed along the carriages offered light. Second class travellers had to contend with being exposed to the elements, and with sitting on wooden benches. With the enclosure of some of these carriages, second-class became an easier way to travel, while third class had to make do with being exposed to weather. By 1844, courtesy of the Railway Act, third class carriages had to be enclosed. Lighting was also provided, albeit only one oil lamp per carriage as opposed to the many placed in first class. As in any sort of mass transportation today, accidents did happen on Victorian railways. Sometimes it wasn't the train that was at fault, but the attending structures which allowed the rails to cross Great Britain. On Christmas Eve 1841, near Reading, a train loaded with produce and passengers ran into a land slip. Carriages were thrown everywhere, with goods and passengers thrown out of the train. At this time, most carriages were without roofs so there was nothing to stop the passengers from either flying out of the train, or falling between carriages and being crushed. This accident was remembered in the Railway Act of 1844. Shortly after Christmas, in 1879, The Tay Railway Bridge collapsed into the Firth of Tay, Dundee. 75 people lost their lives due to the failure of this bridge.